Interesting rare isolated ophiuroid vertebrae have been discovered in washings from the so-called "white beds" of Lower Devonian (Trebotov Limestone, Dalejan) of the Barrandian area. We interpret these vertebrae as belonging to a member of the Family Klasmuridae Spencer, 1925 (Order Stenurida Spencer, 1951; Suborder Scalarina Hotchkiss 1976). This is the first report of isolated vertebrae of these ophiuroids in the world. A short note on the Barrandian "white beds" is also presented here. Unusual ophiuroid vertebrae were discovered in washings from the so-called "white beds" of the Trebotov Limestone (Dalejan, Lower Devonian) of the Barrandian area. They are small, tabular, with an auluroid canal and a conspicuous aboral radial sulcus. Vertebrae of this type are characteristic of ophiuroids of the Family Klasmuridae (Order Stenurida Spencer, 1951; Suborder Scalarina Hotchkiss 1976). In particular, small, tabular vertebrae such as these are characteristic of Klasmura clavigera Ruedemann 1916, and Antiquaster magrumi Kesling 1971. The former is from the Upper Devonian (Frasnian) Gardeau Formation (West Falls Group) of New York, and the latter is widespread, being found in the Middle Devonian Silica Formation of Ohio and Hamilton Group of New York, and in the Silurian Lower Ludlow Shales of Herefordshire, England. Large vertebrae of this type have not yet been found in the washings. Larger size is characteristic of K. mirabilis Ruedemann 1916 and K. macropleura Hotchkiss 1976 (Gardeau Formation, New York) and Protasteracanthion primus Stuertz 1886 (Hunsruck Shale, Germany). A new photograph of P. primus is given by Bartels, Briggs and Brassel (1998, fig. 236, p. 264). Pectenura horni Haude 1982 from the Carboniferous Rhenish Schiefergebirge (lowermost Namurian) has more intricately sculptured small vertebrae. Autotomy of rays is indicated in Klasmura by finding short lengths of rays that are detached yet are in good condition, and finding mouth-frames that lack rays yet otherwise are complete (Gardeau Formation). A six-rayed specimen of Pectenura appears to have been regenerating a mouth frame and six rays, probably indicating asexual propagation from autotomized lengths of rays (Haude 1982). Among all of the Stenurida, the klasmurids have the longest geological range and the greatest richness of species and genera in a single family. The structure of the klasmurids is remarkably uniform. As stressed by Kesling (1971) the structure is noteworthy because it strongly recalls important features of the somasteroids. Klasmurids have distinctive sublateral and lateral plates that show strong transverse alignment with the ambulacrals (metapinnular structure). The underside of the rays is flat (no ambulacral groove) and the upperside also appears to have a low profile. The bases of the rays are incised forming interradial slits, which are not covered over by disk, thus establishing a petaloid outline to the rays. The somasteroid features of klasmurids are important to understanding the ancestry of the ophiuroids. In well-preserved klasmurids the halves of most of the vertebrae are held together quite well, but some vertebrae show a small dislocation or separation of the ambulacral ossicles (Ambb). 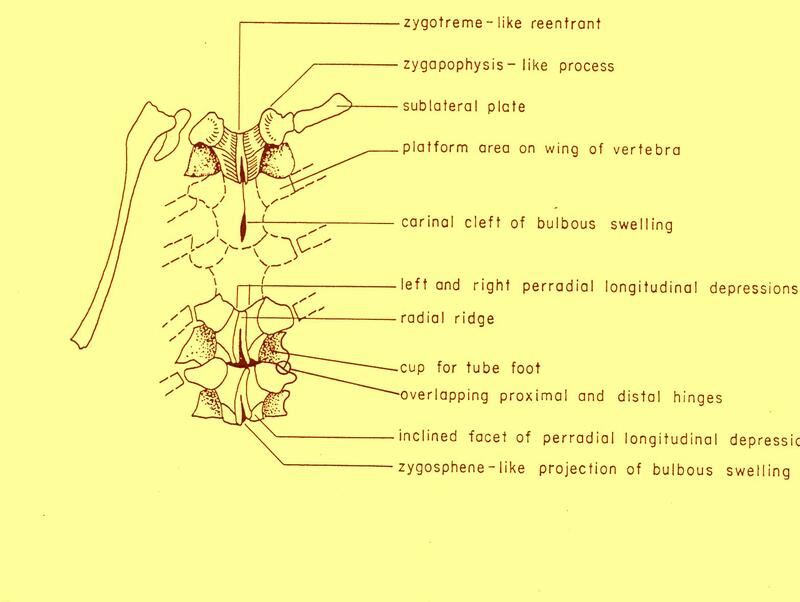 Previous reports have stated that the Ambb of klasmurids are in unfused opposite pairs simulating vertebrae (Kesling 1971, p. 188 - "Ambb pairs firmly adjoined but not fused, forming primitive vertebrae"; Hotchkiss 1976, p. 4 - "slight dislocations relative to one another show that the halves of vertebrae are not actually fused together"). The Bohemian vertebrae provide new information and show very clearly that at least some (and perhaps many) of the Ambb of klasmurids were fused enough to be preserved as isolated whole vertebrae. This is consistent with the development of living ophiuroids. The Ambb always start ontogenetically as two separate plates. Then the stereom of each plate comes into close proximity with the other and makes a mechanical suture between the halves. The suture can be strong enough to keep the vertebrae in a single piece during fossilization and any recrystallization will make the bond even stronger. But the suture is also a plane of weakness, and in a given fossil some vertebrae may fall apart along this suture, sometimes more and sometimes less. With further growth the joined plates may become fused, the stereom may become actually continuous so that the two halves are a solid piece. These ontogenetic stages do not have the great classificatory significance that is given them by Kesling and many other writers (Kesling 1971, p. 183 - key to the orders of Ophiuroidea). Although there was an evolutionary trend from unfused to fused halves of vertebrae the difficulty is that there is much variability between growth stages and also variability according to the rigors of taphonomy and preservation. Probably many klasmurid vertebrae fell apart and only a few remained whole like those from the washings of weathered limestones of the Bohemian Devonian. It ought to be stressed that an example exists among Recent ophiuroids of a lack of complete fusion of the halves of vertebrae in Ophiuropsis lymani var simplex (Family Asteroschematidae) when treated with sodium hypochlorite (Mortensen 1933, p. 9). Describing the ambulacrum of Antiquaster as "more of a surface than a groove," and thinking that the Ambb were not fused, Kesling (1971, p. 184) speculated "that the Ambb may have been flattened during fossilization, that in life they may have been slightly arched, and that the arching may have been accomplished by contraction of interambulacral muscles along the oral margins of the Ambb." This idea relates to the general theme of Spencer (1951, p. 88) and of Fell (1963, p. 389) that at first (in somasteroids) the ambulacral groove was not much of a groove, and it became a permanent groove by the arching of the Ambb as in asteroids. For the Ambb to arch, the Ambb could not be fused. We recognize now that the Ambb cannot have arched in klasmurids because the Bohemian vertebrae show very clearly that at least some of the Ambb were fused well enough to be found as whole vertebrae. A short note on the preservation of echinoderms in the Barrandian "white beds"
Regarding the preservation of klasmurid vertebrae, it ought to be stressed that in the washings from the Trebotov Limestone, the echinodermal ossicles are typically disarticulated, only with the exception of some microcrinoid calyces and pluricolumnals. In general, the Barrandian "white beds" are built of skeletal pieces and of soft cement (it is not so voluminous as in the original rock and is chemically changed) which must be washed out on the sieves. This cement is at some localities extremely rich (e.g., at the "lobolith hillside" - Upper Pridolian, uppermost Silurian, at Praha-Reporyje), at others almost lacking (e.g., at Cerna skala quarry, Praha-Reporyje, Kotys Limestone, Lower Devonian, Lochkovian - there are biostrome layers of beautiful pink color alternating with yellow ooze without any trace of life). At the Cerveny lom quarry (Lodenice Limestone, Lower Devonian, Pragian), the cement forms about one half of the weathered material, which is the most usual proportion. It is fascinating that the hard limestone in surroundings of such weathered places is utterly normal-looking micritic limestone with minimal visible indications of fossils, only remains of crinoid columnals are discernible but they can be identified only according to their rounded shape and nothing more (they possess no lumen, no articulating faces or sculpture, but are only a smooth rounded piece of calcite). Therefore, the appearance of fossils in the weathered portions of the same layer (echinoderms are well-preserved but other phyla are poorly preserved) is utterly perplexing. The most important factor of such miraculous reappearance of nearly perfect, abundant and beautiful ossicles from the ghost remains in the unweathered limestone must be time. We think that it is simply because the weathering takes place during millions of years (in the Barrandian area probably beginning at about the Cretaceous time; see also Petr et al. 1997). The original sediment is frequently soft carbonate ooze without distinct indication of transport of the fossils. Sorting of skeletal remains is minimal, there are large pieces around 1 cm amongst the material of pieces reaching only 0.2 mm to 1 mm. In many cases of crinoid arms and stems, and of crinoid and blastoid calyces, the ossicles are still articulated which indicates relatively minimal decay, minimal transport and minimal reworking. However, the ophiuroid, asteroid, holothuroid, ophiocistioid and echinoid ossicles are never articulated (for further information on taphonomy see Donovan 1991, Parsons and Brett 1991, and esp. Brett, Moffat and Taylor 1997). Several vertebrae have been collected from the so-called "white beds" in the uppermost portion of the Trebotov Limestone (Dalejan, Lower Devonian), particularly in uppermost layers, about 4-4.5 m below the boundary with the Middle Devonian Chotec Limestone, till the very Lower-Middle Devonian boundary (i.e., Emsian-Eifelian boundary), occurring in washings together with numerous dacryoconarids, brachiopods and especially with other rich echinoderm fauna, esp. crinoids (the most abundant inadunates, partly camerates), at the classical locality "Prastav" quarry at Praha-Holyne (the locality is not far from the quarry "Holyne" which serves as the parastratotype for Lower-Middle Devonian boundary (see especially the articles by Chlupac 1982a, b, and 1994a, b). During this research we recognized a specimen of Antiquaster magrumi in the collections of the Museum of Camparative Zoology, Harvard University: No. 385, Church Hill, Lower Ludlow, labeled "Palaeocoma marstoni Salter". This is only the second specimen of Antiquaster known from this locality. We are indebted to Frederick J. Collier, Curatorial Associate, Department of Invertebrate Paleontology. We examined also some unpublished specimens of Antiquaster sp. coming from the Renault Formation, Mississippian-Chesterian, found at Waterloo, Illinois, deposited in the collections at the Department of Palaeontology, National Museum, Museum of Natural History, Praha (donated by FHCH) and illustrating structure of klasmurid vertebrae in whole body fossils. Better specimen shows the oral side, the other shows the aboral. Zajimave izolovane obratle hadic byly nalezeny ve vyplavu z "bilych vrstev" trebotovskych vapencu (spodni devon, dalej, Barrandien). Tyto obratle prirazujeme k zatim nespecifikovanemu druhu celedi Klasmuridae Spencer, 1925 (rad Stenurida Spencer, 1951; podrad Scalarina Hotchkiss 1976). Jedna se o prvni nalez izolovanych obratlu techto hadic na svete. V clanku se tez kratce zminujeme o charakteru "bilych vrstev" Barrandienu. Text-fig. 1: Klasmura macropleura Hotchkiss 1976, Upper Devonian (Frasnian) Gardeau Formation (West Falls Group) of New York: diagrammatic sketch of the arm of the holotype (New York State Museum, n. 7770) in oral view (after Hotchkiss 1976, Text-fig. 1, modified). Text-fig. 2: An illustration to the note on the character of the Barrandian "white beds" showing typical content of washings from the Lodenice Limestone (Lower Devonian, Pragian), "Cerveny lom" quarry near Praha-Klukovice: in this picture we can see weathered (and generally damaged) remains of dacryoconarids (1), orthothecids (2), gastropods (3), and brachiopods (4), while the skeletal ossicles of echinoderms (5-25) are abundant and really well-preserved (including the original stereom! 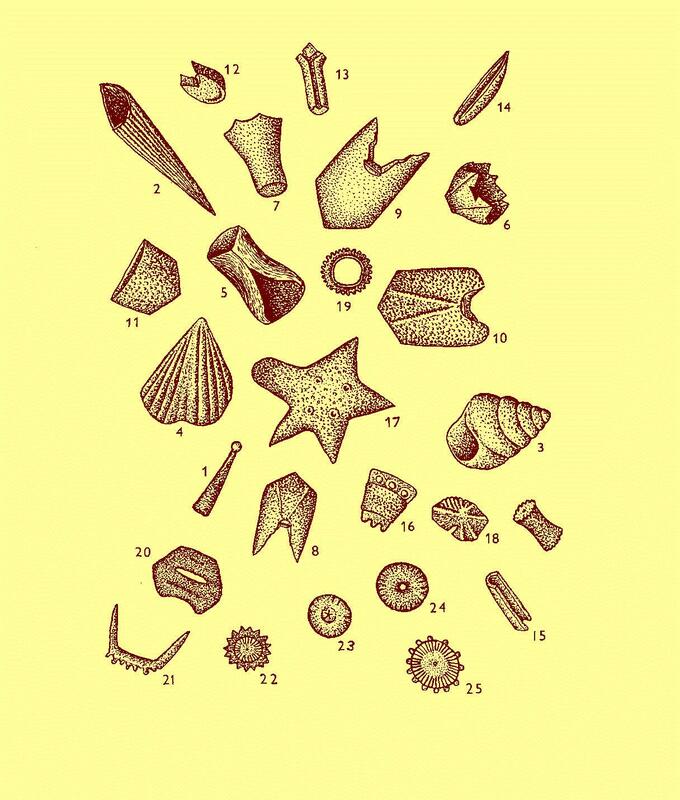 ), particularly crinoid cups and cup plates (5-11) as of the genera Eohalysiocrinus (5), Pygmaeocrinus (6), Gemmacrinus (7-9), Elicrinus (10), Lecanocrinus (11), remains of crinoid arm plates (12-15), plates from the thecae of other echinoderms as cyclocystoids (16), asteroids (17) and rhombiferans (18-19), and, of course, numerous crinoid columnals (20-25), some of them very typical as of the genera Myelodactylus (20) or Ammonicrinus (21). Photo 1: Klasmuridae gen. et sp. indet., uppermost portion of the Trebotov Limestone (Lower Devonian, Dalejan), "Prastav" quarry, Praha-Holyne. The aboral radial sulcus and the auluroid canal (well-visible in the specimen to the right) are the diagnostic features of klasmurids. The tabular shape is particular to the genera like Antiquaster, with small vertebrae. The form of large klasmurid vertebrae is more block-shaped (not so thin and tabular). All the figured specimens are deposited in collections of the Department of Palaeontology, National Museum, Museum of Natural History, Praha, inv. n. L 33133 - L 33135. x10. Brett, C. E. - Moffat, H. A. - Taylor, W. L. (1997): Echinoderm taphonomy, taphofacies, and Lagerstatten, p. 147-190. In: Geobiology of Echinoderms, Paleontological Society Papers, vol. 3. Chlupac, I. (1982a): Preliminary submission for Lower-Middle Devonian boundary stratotype in the Barrandian area. - Courier Forschungsinstitut Senckenberg, 55, 85-96. Frankfurt a. M.
Chlupac, I. (1982b): Mezinarodni parastratotyp hranice mezi spodnim a strednim devonem na ceskoslovenskem uzemi. - Vest. Ustr. Ust. geol., 57, 316-318. Praha. Chlupac, I. (1994a): Facies and paleogeographic relationships in Devonian of the Bohemian Massif. - Journ. Czech Geol. Soc., 39, 1, 16-17. Praha. Chlupac, I. (1994b): Facies and biogeographic relationships in Devonian of the Bohemian Massif. - Courier Forschungsinstitut Senckenberg (Willi Ziegler Festschrift II), 169, 299-317. Frankfurt a.M.
Donovan, S. K. (1991): The taphonomy of echinoderms: calcareous multi-element skeletons in the marine environment, p. 241-269 (Chapter 11). In: S. K. Donovan (Ed. ): The processes of fossilization, 303 pp. Columbia University Press. Fell, H. B. (1963): The phylogeny of sea-stars. - Philosoph. Trans. Roy. Soc. London, Ser. B, 246, 735, 381-435. London. Haude, R. (1982): Ophiuren (Echinodermata) aus dem Karbon des Rheinischen Schiefergebirges. - Geol. Jb. Hessen, 110: 5-26. Wiesbaden. Hotchkiss, F. H. C. (1976): Devonian ophiuroids from New York State: Reclassification of Klasmura, Antiquaster, and Stenaster into the Suborder Scalarina nov., order Stenurida. - Bull. New York State Mus., 425: 1-39. Albany. Kesling, R. V. (1971): Antiquaster magrumi, a new unusual brittle-star from the Middle Devonian Silica Formation of northwestern Ohio. - Contrib. Mus. Paleont. Univ. Mich., 23, 10, 181-191. Ann Arbor. Mortensen, Th. (1933): Studies of Indo-Pacific euryalids. - Vidensk. Medd. fra Dansk naturh. Foren., 96 (Festskrift. II. ), 1-75. Kobenhavn. Parsons, K. M. - Brett, C. E. (1991): Taphonomic processes and biases in modern marine environments: an actualistic perspective on fossil assemblage preservation, p. 22-65. In: S. K. Donovan (Ed. ): The processes of fossilization, 303 pp. Columbia University Press. Petr, V. - Prokop, R. J. - Mihaljevic, M. - Sebek, O. (1997): Chemical composition of the crinoid skeletal remains (Echinodermata) in the weathered limestones of the Bohemian Lower Devonian (Barrandian area). - J. Czech Geol. Soc., 42, 1-2, 41-58. Praha. Ruedemann, R. (1916): Paleontologic contributions from the New York State Museum, I: Account of some new or little-known species of fossils, mostly from Paleozoic rocks of New York. - N. Y. State Mus. Bull., 189, 7-112. Albany. Spencer, W. K. (1951): Early Palaeozoic starfish. - Philosoph. Trans. Roy. Soc. London, Ser. B, 235, 623, 87-129. London. Stuertz, B. (1886): Beitrag zur Kenntnis palaeozoischer Seesterne. - Palaeontographica, 32: 75-98. Stuttgart.